The invasion scares that had periodically flared up in Britain during the French Second Empire of Napoleon III had abated by 1881, but it was recognized that the regular army had to modernize in view of the rise of the influence and power of Germany. Also, the Volunteer units that had first been raised in 1859 were still in existence, as were the Volunteer Yeomanry cavalry which had been raised before them at the end of the previous century. The numbers of Volunteers fluctuated according to the perceived level of the threat of invasion, as well as the economic conditions of the Volunteers themselves. In 1861 the Royal Gloucestershire Hussars were first issued with Westley-Richards breech-loading carbines, at six per troop, and in 1870 the whole Regiment was armed with them. The Westley-Richards was a very accurate weapon for its day, though prone to fouling, and an ideal addition to the equipment of the modern cavalryman. Shooting competitions became popular in the Regiment in the 1860s, creating a tradition that would continue for many years, with carbines being given away as prizes to the best shots. Snider carbines replaced the Westley-Richards in 1879. The official establishment of the Royal Gloucestershire Hussars during the previous forty years had been between 420 to 470 men. In 1875 it was set at 445, but these figures were hard to maintain and in 1881 only 246 men were present with the Regiment for their inspection parade and field day at Cheltenham on 11th May 1881. Seven weeks previously the First Boer War had come to an end, and Great Britain had signed a humiliating peace. Her scarlet-coated soldiers had been bested by fast-riding and hard-hitting farmers, armed with breech-loading carbines and wearing their everyday clothes. 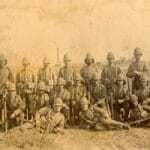 At the battle of Majuba Hill on February 27th the military reputation of the British army had reached a nadir. W.H. Wyndham Quin, “The Yeomanry Cavalry of Gloucestershire and Monmouth”. 1898. In less than twenty years Colonel Burnaby’s words would be put to the test, as officers and troopers of the Royal Gloucestershire Hussars found themselves in action against their counterparts in South Africa. Picture: Royal Gloucestershire Hussars on manouevres, c. 1897. Original in Soldiers of Gloucestershire Museum Collection.